What is this "Reciprocity" issue all about? Subd. 16. Recognition of permits from other states. (a) The commissioner must annually establish and publish a list of other states that have laws governing the issuance of permits to carry weapons that are not substantially similar to this section. The list must be available on the Internet. A person holding a carry permit from a state not on the list may use the license or permit in this state subject to the rights, privileges, and requirements of this section. (b) Notwithstanding paragraph (a), no license or permit from another state is valid in this state if the holder is or becomes prohibited by law from possessing a firearm. (c) Any sheriff or police chief may file a petition under subdivision 12 seeking an order suspending or revoking an out-of-state permit holder's authority to carry a pistol in this state on the grounds set forth in subdivision 6, paragraph (a), clause (3). An order shall only be issued if the petitioner meets the burden of proof and criteria set forth in subdivision 12. If the court denies the petition, the court must award the permit holder reasonable costs and expenses including attorney fees. The petition may be filed in any county in the state where a person holding a license or permit from another state can be found. (d) The commissioner must, when necessary, execute reciprocity agreements regarding carry permits with jurisdictions whose carry permits are recognized under paragraph (a). Short form: Handgun carry permits from other states are supposed to be good in Minnesota, except for those few states that have permit issuance laws that are very different than Minnesota's -- those that are not "substantially similar." Minnesota's carry law requires some fairly modest training and a background check. That's all. The job of the Commissioner of Public Safety is to find out which states do not require at least some training and a background check, and annually put out a list of those states, and those States' permits are to be considered insufficient for carrying in Minnesota, leaving all other States' permits acceptable for carry in Minnesota. Simple, right? Trouble is, The Commissioner didn't do that. And his boss -- Governor Pawlenty -- didn't make him. Instead, the DPS put out a much longer list. Bottom line is that the DPS decided to interpret "substantially similar" as "virtually identical" to Minnesota law. Needless to say, this eliminated many otherwise conforming states. Why should anybody care about this? Lots of reasons, actually. For one thing, the right to keep and bear arms is a fundamental, individual right, which should not be infringed on the whim of some unelected official. For another, those states whose permits are honored by Minnesota are more likely to honor Minnesota's permits, allowing traveling Minnesotans to be able to carry handguns to protect themselves in more places. Government bureaucrats should follow the law; they should not make it up to fit their own views. In 2005, in order to get support of the self-defense community in a very close election, Governor Pawlenty made an election promise though his legislative aide and Chief of Staff to get this reciprocity problem fixed, but he hasn't. He "slow-rolled" the advocates demanding that he follow the law -- as even his opponent, Mike Hatch, had promised to -- and the Governor has been failing to keep his promise ever since. There were 40,000 permit holders in Minnesota then; Pawlenty won by 20,000 votes. Permit Holders aren't the only ones for whom this is a problem. Ask the folks calling usual Republican contributors to ask for money and support. 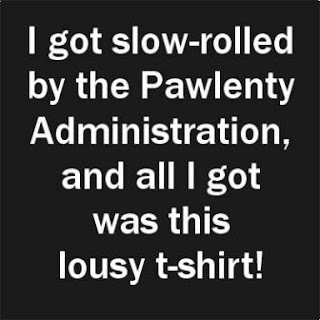 For more than a year now, each and every one of the low-level employees and volunteers has been hearing, over and over again, "not a dime for Republicans until Pawlenty fixes the reciprocity mess." Welching on a promise isn't just unethical; it's expensive, and the cost isn't born just by the promise breaker. I think Governor Pawlenty needs to keep his word -- he can order his Commissioner of Public Safety to simply (and immediately) take all of the more than thirty states that require some training and a background check for a carry permit off the "bad list." Or he can live with the consequences of people saying, over and over again, that he's simply not been as good as his word. It is often said that the only thing a politician has to recommend him is his word, and that if that's no good, he's no good. Sadly, I'm becoming one of those people who now doubts the Governor's word, and I've told him so. What should you do? That's up to you.